Landing all-weather aircraft safely in storms. Protecting sensitive data not only through encryption but based on the location at which it is being accessed. Ensuring that accurate and timely information reaches first responders responding to emergencies. Although still in the early part of her career, Di Qiu has already made significant contributions to these crucial applications of navigation technology. Currently a senior research engineer at location-based services (LBS) solutions provider Polaris Wireless, Qiu’s work brings together the fields of navigation and security through innovative engineering, adding value to existing technologies and creating exciting new synergies. Qiu developed her expertise through research and experimentation in the aerospace engineering and aeronautics and astronautics departments, respectively, at the University of California, Los Angeles, and Stanford. Since completing her Ph.D. at Stanford in 2009, she has applied the lessons of those academic exercises to her professional endeavors. Di Qiu’s first glimpse of the possibilities of GNSS technology came as an undergraduate at UCLA. She obtained a student position as a lab assistant in the Institute of Geophysics and Planetary Physics (IGPP), a research arm of the university that was working on projects exploiting GPS data to address problems in the earth sciences. She recounts seeing how real-time differential GPS with good resolution and accuracy within a meter was able to provide significant benefits to earth scientists. In the course of her work toward a B.S. degree in aerospace engineering, Qiu found an important mentor in William Greer, the principal electronics technician at the IGGP. This work at UCLA required an attention to detail and control of intricate systems that Qiu would develop further in her subsequent research and professional roles. Qiu graduated from UCLA in 2003, and entered Stanford University’s aeronautics and astronautics engineering program. In her first year at Stanford, she worked on carrier phase smoothing in a GPS course taught by Professor Per Enge and later joined the GPS lab that he directs. She completed an independent study with Enge focusing on ionosphere threat modeling for local area augmentation systems (LAASs), also known as ground-based augmentation systems or GBASs. LAASs are designed for all-weather aircraft landing using real-time differential correction of the GPS signal. Under extreme space weather conditions, fluctuating ionospheric spatial gradients are likely to affect the LAAS architecture, particularly for precision approach and landing capability. In her independent study, she developed a moving wave front model and extrapolated a “threat space” based on previous ionosphere storms. This work outlined a comprehensive methodology to analyze ionospheric anomalies and estimate the moving speed of a modeled ionosphere front based on historic storm data. The method Qiu developed has subsequently been used to analyze the potential effects of ionosphere anomalies on LAAS users. The work on LAAS was instrumental in leading Qiu to achieve the objectives of her Ph.D. thesis: the design, development, and implementation of a robust geo-security system. Geo-security, or location-based security, employs algorithms that limit access to information content or electronic devices based on verifying a specified location or time. Rather than replacing any of the conventional cryptographic means of protection, geo-security instead increases security by augmenting it with added contextual data. Geo-security uses a location verification tag, called a geotag, to extend the security parameters for sensitive data to include the precise physical environment in which it is being viewed. Qiu believes this approach can play a role in “bridging the very different languages used by the navigation and security fields.” Her efforts directly led to two U.S. patents being issued. She sums up this work as “security from location,” protecting sensitive information based on where it accessed. At Stanford, Qiu’s doctoral work explored a related angle, which she describes as “security for location.” Signals for geosecurity should have anti-spoofing capabilities, that is, the capability of detecting and avoiding false signals, a system is vulnerable to spoofing, an attacker can easily bypass location verification. She developed and implemented a test of Timed Efficient Stream Loss-tolerant Authentication (TESLA), an authentication method for broadcast network communications, and validated its performance with her research partners. The combined effect of “security from location” and “security for location” presents a robust location-based security solution, she feels. After completing her Ph.D., Qiu accepted a position as senior research scientist at Sigtem Technology, Inc., a GNSS engineering firm in San Mateo, California. There, she worked on positioning in environments resistant to GNSS signals. Qiu led a project focused on signals of opportunity (SoOP) to achieve indoor positioning by integrating cellular signals, Wi-Fi, and AM/FM, and other radio transmissions. The team built mobile test-beds consisting of a multichannel software-defined radio and associated software receivers. The cooperative mechanism solves the problem of a user’s position when challenged by the absence of time synchronization between signal transmitters and the lack of encoded timing information in the received signals. Qiu also expanded on her work with geo-tagging at Sigtem, developing “coordinate-free navigation” by applying geo-tags derived from various location-dependent features of non-navigational signals to facilitate navigation without defining a position in spatial coordinates. This technique works well in scenarios where GNSS signals are partially or completely denied. Qiu explains another advantage of the method: It requires lower power consumption by user equipment and integrates various systems without time synchronization of all of the transmitters, which has always been a problem in the conventional navigation techniques. Her innovative design led to a U.S. patent application in 2010. Qiu joined Polaris Wireless in 2012 and has been working on the integration of GNSS, cellular signals, and low earth orbit (LEO) communication satellite signals for indoor positioning. 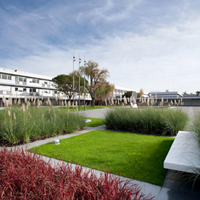 Polaris Wireless is a Mountain View, California—based company that develops software-based location solutions, concentrating in the areas of public safety and location surveillance. 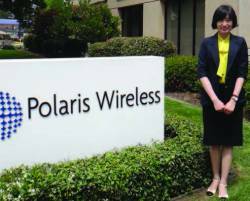 One of her ongoing projects at Polaris involves the integration of sensors in smart phones to provide wireless operators a solution for compliance with the Federal Communication Commission’s (FCC) Enhanced 911 (E911) phase 2 mandate. The second phase of the FCC mandate requires wireless operators to provide first responders at Public Safety Answering Points (PSAPs) with the latitude and longitude of emergency callers within six minutes after receiving a call. Location information is used to send emergency services to the scene of an incident and is also used by the wireless carrier to determine which Public Safety Answering Point (PSAP) to route the call to. Accuracies for network-based E911 techniques must be at least 100 meters for 67 percent of calls and 300 meters for 95 percent. Handset-based technologies, typically using GNSS, must be within 50 meters for 67 percent of calls and 150 meters for 95 percent of them. Indoor and dense urban environments present serious challenges to achieving these accuracies using GNSS. Integrating signals and positioning techniques can generate more reliable positioning data to achieve compliance with the E911 mandate. Polaris Wireless employs radio frequency pattern matching (RFPM) to enhance location-based services such as E911. As with satellite-based navigation systems, RFPM is based on correlation techniques. It matches the signal strength of cellular signals measured by mobile phones to a geo-referenced database that maps cellular operators’ signal strengths in a given coverage area. RFPM accuracy depends heavily on the quality of the values in the signal-strength database. At Polaris, Qiu is developing a sophisticated signal-propagation model to help construct the signal-strength database, aggregating data on cell transmitter antenna locations and cell type. Geo-referenced data incorporated into this signal-propagation model include tree canopy, buildings, and terrain elevations, as well as other topographical and traffic details. Qiu’s work enhances the accuracy of the signal-strength database and estimates of signal availability at a given location — the linchpin in achieving E911 phase 2 compliance. Throughout Qiu’s student and professional life, teamwork and collaboration have proved essential to delivering the impressive results her projects have generated. She has benefited from the guidance and inspiration of mentors at UCLA and Stanford, and has consistently worked on very team-oriented projects. This affinity for contributing to a group effort manifests itself outside of engineering as well. She likes to balance efficiency and enjoyment in her personal and working lives by making the most of her days.